Today is a day worth celebrating! After a full week of being cooped up in the house because my family is suffering from the flu just to be followed up by an entire day of being iced in with zero power, no heat, and a super fussy and feverish toddler, I am happy to announce that none of that matters because we have a brand new and *HEALTHY* baby boy in our family! Last night, Will’s sister and her husband welcomed their son into the world. He is positively perfect in every way. 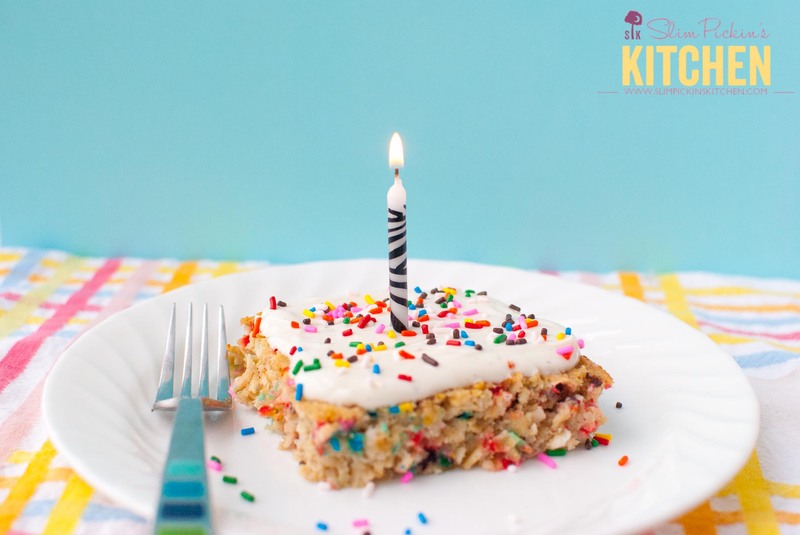 Bust out the funfetti cake breakfast bake! The past few weeks I have been experimenting with baked oatmeal because it is such an easy and healthy breakfast for us to have in the mornings. Owen is absolutely starving as soon as he wakes up, and I’ve realized that I have to prep his breakfast the night before otherwise he will pitch a fit and go into full-blown melt down mode until he has food in his face. He gets his lack of patience from his father (no he doesn’t). Breakfast bakes are crazy easy to make and the variations are endless! Y’all know that I love me some overnight oats which I will be making come spring and summer, but during the winter warm baked oatmeal is where it’s at! 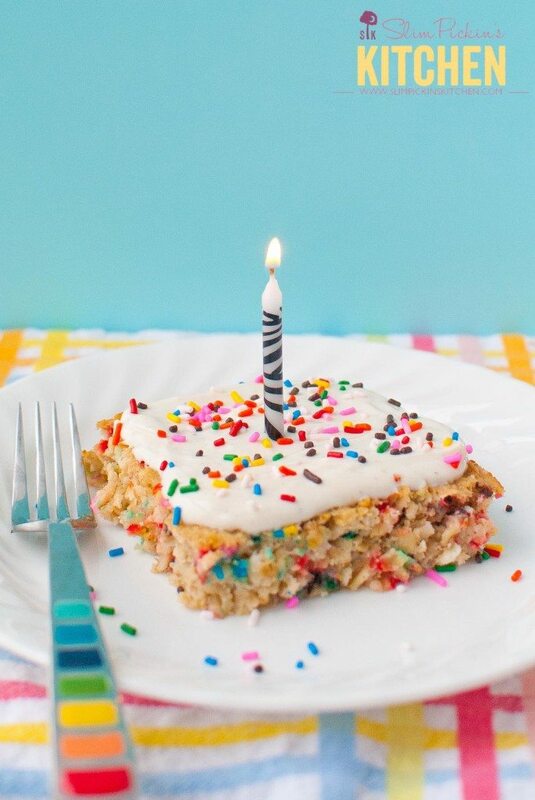 Like I said, I’ve been experimenting with breakfast bakes a lot lately and the idea for this funfetti cake breakfast bake came from a granola bar recipe I wanted to try on Pinterest but never got around to making. I ended up whipping this up instead, and I’ve made it several times since. 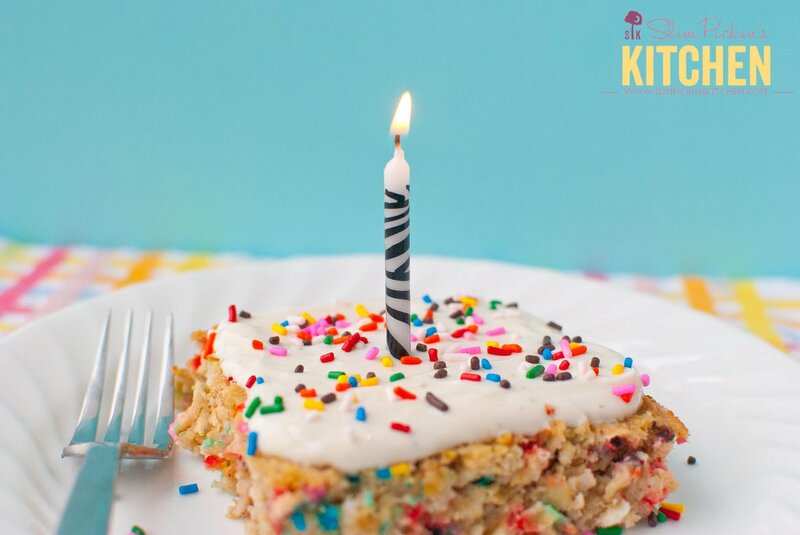 This is the perfect fun and festive breakfast recipe to make for yourself or for your family when it’s someone’s birthday, but you don’t want to go through the hassle of making pancakes or waffles. My whole family loves this recipe too because you feel like you are eating something super naughty for breakfast, but the fact of the matter is that you’re not! I have zero problems giving this to Owen on a regular basis because the breakfast bake itself has NO ADDED SUGAR. Unsweetened applesauce and the yogurt “frosting” give it the perfect amount of sweetness. Y’all know that I try very, very hard to stay away from artificial ingredients, but this recipe has one that is absolutely necessary to achieve that cake batter like flavor and, since the recipe only calls for 1.5 teaspoons worth, I really don’t have an issue with using it. Off the top of my head, I have four options that may work, but I’ve only actually tried the first two myself. Your options include: powdered vanilla-caramel coffee creamer, butter extract, actual funfetti cake mix, or maybe even cake batter flavored coconut butter. By far my favorite option is the coffee creamer, but choose whichever ingredient works best for you and your family’s dietary needs. 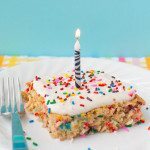 This delicious and healthy funfetti cake breakfast bake is a wonderful and easy baked oatmeal to serve for breakfast for someone's birthday! Preheat oven to 350 degrees (F) and spritz an 8x8 inch square baking dish with non-stick spray. Set aside. Combine all ingredients, except yogurt, in a large bowl and stir until evenly mixed. Pour oatmeal batter into the baking dish and bake for 35-40 minutes or until cooked through. Allow to cool for 5 minutes. Top with yogurt and additional sprinkles then serve. 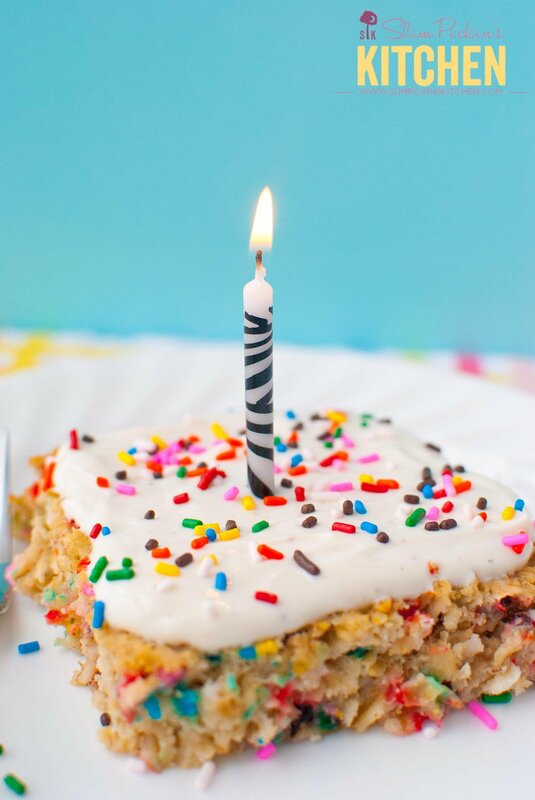 Like funfetti cake recipes? 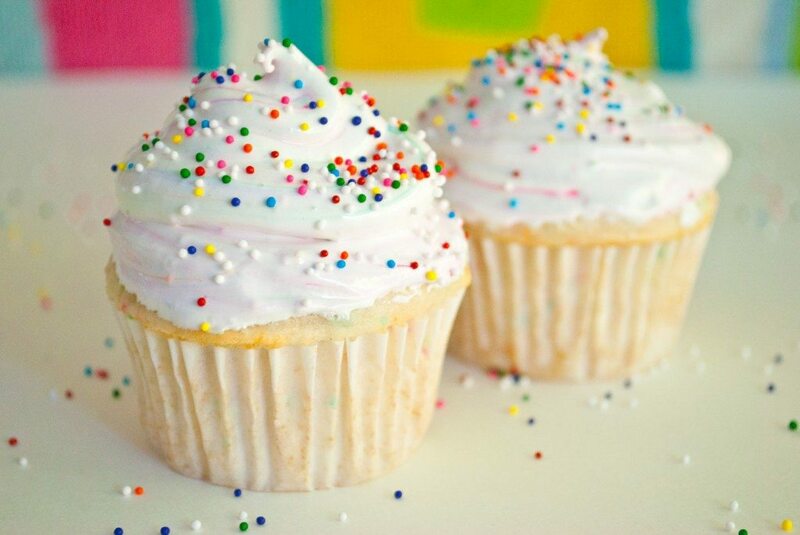 Be sure to check out my Skinny Funfetti Cupcakes with Cake Batter Marshmallow Frosting for Two! Hey girl hey! It seems like its been forever! This is adorable! Can I confess something? I heat my overnight oats. Don’t tell. I just can’t get behind the idea of cold oatmeal. I make them overnight only because its the only way for me to make my weekly morning gym date with my classmate Em…then I just heat up the oats (assembled the night before!) when I get to work. I will definitely try this! And see if I can trick my lovely husband into eating it. I loveeee all things funfetti and this looks amazing! I looooove this recipe! Let me know if you try it!